An e-bike is a power-assisted bicycle fitted with a lightweight battery and electric motor. You pedal and use your gears just like on a standard bike, but the motor just gives you a helping hand. What are the benefits compared to a standard bike? 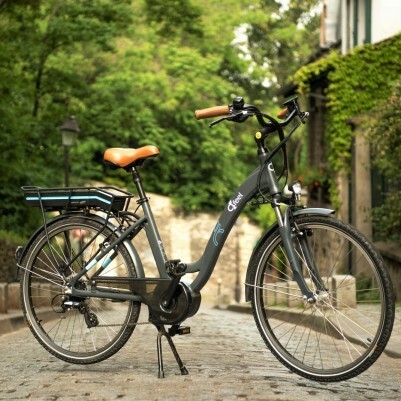 Electric bikes provide all the benefits of a normal bike - gentle exercise, fresh open air, interaction with nature and other cyclists - plus electric assistance on longer rides with the occasional climb and uphill section. You’ll be able to cycle further, faster, tackle steep climbs and ultimately discover more places than you thought possible. If you’ve not ridden a bike since your school days or you're simply not as fit as your cycling buddies, you might find the idea a bit daunting, but using an electric bike gives you an extra push and requires less legwork than a standard bike. E-bikes are great fun for competitive couples who want to race to the next hill village (the power is capped at 25kph) and they are the perfect solution for people wanting to share holiday experiences, but who don't necessarily share the same levels of fitness. Having power assistance means you will be able to comfortably cycle further too (if you wish), meaning more places are within visiting distance. Electric bikes are available on many of our holidays, usually at a small supplement. You can reserve as many bikes as you require for your party but please note we can only provide them for over-18s between 5 and 6 feet tall. Look out for the e-bike symbol in the holiday search results and the individual holiday pages. Numbers are limited and they're available on a first-come first-served basis, so if you're keen to try them out then do make sure you book early. Although our e-bikes are easy to use, they are heavier than regular bikes and as such are better suited to proficient cyclists. We do not recommend these for anyone out of practice on a bike. Please contact us to discuss their suitability for any members of your party. Please note: Bike styles may differ from the examples shown.